Oil, and oil control is important to keeping your engine alive. Dry sump oiling came into use with airplanes, and racing vehicles. Once you start seeing loads over 1G, the oil wants to go anywhere but to the oil pickup. Ross Performance in Australia has started to offer complete RB series engines dry sump oiling kits. Having to remove the A/C is a bit of a deal breaker, after all, can't we have it all? Improved engine reliability due to consistent oil pressure. This is the reason why dry-sumps were invented. Increased oil capacity, by using a larger external reservoir than would be practical in a wet-sump system. Prevention of the engine experiencing oil-starvation during high g-loads, which is particularly useful in racing cars, high performance sports cars, and aerobatic aircraft. Dry-sump designs are not susceptible to the oil movement problems from high cornering forces that wet-sump systems can suffer where the force of the vehicle cornering can cause the oil to pool on one side of the oil pan, possibly uncovering the oil pump pickup tube and causing cavitation and loss of oil pressure. Improvements to vehicle handling and stability. The vehicle's center of gravity can be lowered by mounting the engine lower in the chassis due to a shallow sump profile. A vehicle's overall weight distribution can be modified by locating the external oil reservoir away from the engine. Improved oil temperature control. This is due to increased oil volume providing resistance to heat saturation, the positioning of the oil reservoir away from the hot engine, and the ability to include cooling capabilities between the scavenger pumps and oil reservoir and also within the reservoir itself. The ability to release gasses trapped in the oil from ring blow-by and the action of the crankshaft and other moving parts in the oil, then return these gases via a line from the top of the oil reservoir to the combustion chamber. Improved pump efficiency to maintain oil supply to the engine. Since scavenge pumps are typically mounted at the lowest point on the engine, the oil flows into the pump intake by gravity rather than having to be lifted up into the intake of the pump as in a wet-sump. Furthermore, scavenge pumps can be of a design that is more tolerant of entrapped gasses than the typical pressure pump, which can lose suction if too much air mixes into the oil. Since the pressure pump is typically lower than the external oil tank, it always has a positive pressure on its suction regardless of cornering forces. Increased engine horsepower due to reduced viscous and air friction. In a wet-sump engine the crank shaft and other moving parts splash through the oil at thousands of RPM causing a "hurricane that whips the oil in a wet-sump engine into an aerated froth like a milkshake in a blender". Additionally, in a wet-sump, each revolution generates minute amounts of parasitic power loss caused by viscous drag and air drag (or 'windage') as the parts move rapidly through the oil and air in the lower engine. At high RPM these small sources of drag compound dramatically, resulting in significant power loss. In a dry-sump, the scavenger pump removes the oil and therefore the source of viscous friction, but also creates an air vacuum that significantly reduces air-friction, thus freeing the moving parts of much viscous and air friction and allowing engine power output to increase. Having the pumps external to the engine makes them easier to maintain or replace. Dry-sump systems add cost, complexity, and weight. 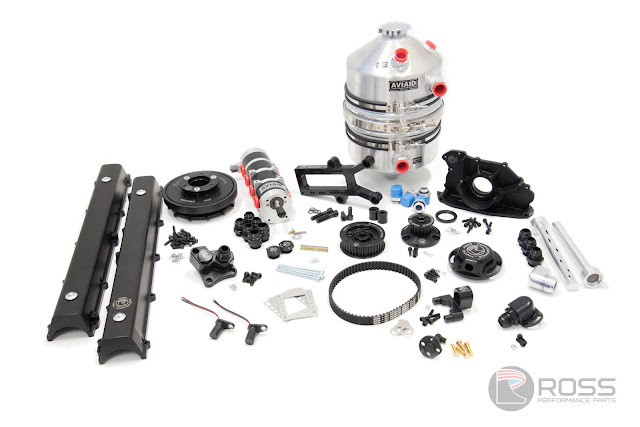 The extra pumps and lines in dry-sump engines require additional oil and maintenance. The performance-enhancing features of dry-sump lubrication can hurt a car's day-to-day drive-ability. A good example is the classic Mercedes-Benz 300SL, a car that was designed for racing but sold to the general public and used on-road. The car had high oil capacity and a dry-sump system to cope with continuous high-speed running while racing. Owners found in general use, however, that the oil never achieved the correct operating temperaturebecause the system was so efficient at cooling the oil. A makeshift solution was devised to deliberately block the oil cooler airflow to boost the oil temperature. The large external reservoir and pumps can be tricky to position around the engine and within the engine bay due to their size. As wrist pins and pistons rely for lubrication and cooling respectively, on the oil being splashed around in the crankcase, these parts might have inadequate oiling if too much oil is pulled away by the pump. Installing piston oilers can circumvent this issue, but do so with additional cost and complexity for the engine. Inadequate upper valvetrain lubrication can also become an issue if too much oil vapor is being pulled out from the area, especially with multi-staged pumps. This kit does not include a sump. Modification to your 4WD sump is required.